Leo and Cancer have diametrically opposite natures: they have little in common, and therefore such a union is rare in life. Their elements are also in contradiction. Leo belongs to the elements of fire, and Cancer is the water element. These two natural elements can affect each other destructively. A lot of water will probably put out the fire. And strong flames, in turn, are able to evaporate moisture to the last drop. On the other hand, the element of water prevents the transformation of a small fire into a terrible conflagration, and the fire maintains the water in a comfortable warm state, preventing it from freezing into ice. If the signs learn to keep a balance in the relationship, taking into account their own and other people’s characteristics, they can build a beneficial tandem. The Leo is ruled by the Sun, giving him such qualities as: charisma, energy, pride and generosity. Leo, as a true king, needs people who play the role of his subordinate retinue. It depends on their praise and approval. His vital need is to be in any company the most intelligent, beautiful and authoritative, and that all this has confirmation in the mouths of others. He is strong, brave and very determined. The sign of fire is used to dominate and command and is genuinely surprised if someone does not recognize the leader in it. His royal persona is usually seen from afar. Cancer, too, can not miss it. The sign of water is the ward of the Moon — a planet that answers in astrology for emotions. In this regard, he is endowed with deep sensitivity, naturally reacts to the slightest changes in the environment and the feelings of the surrounding people. His mood can change so often that even the sign sometimes does not understand what is happening to it. Cancer is inclined to fall into melancholy, loves to cry and reckon about the injustice of this world, and sometimes just for the soul. At such moments, he closes in himself, fenced off from the whole world. Also, hide in his shell, he is forced by the difficulties with which he encounters in life, a situation of uncertainty or impotence. Cancer needs a strong partner, which will give it confidence, helping to overcome difficulties. Thanks to such different ways of existence, the compatibility of Leo and Cancer is at a very low level. In priority, Leo has his ambitions, aspiration for power and satisfaction of the ego, which demands universal recognition. Only under such conditions he can feel happy. And for this he needs close and friends. Cancer also needs to be surrounded, but only in such a way, with whom it will feel emotional closeness, comfort and safety. In fact, both are worried about themselves: a fire sign nourishes one’s self-esteem, and the elements of water seek support and a sense of security. The compatibility horoscope of Leo and Cancer promises them a successful relationship if they can meet each other’s basic needs. And this they have every chance, because Cancer loves to take care and give warmth to those who are next to him. And Leo will certainly like being in the center of this care, and in gratitude he will protect such a valuable partner that gives him a sense of his own worth. 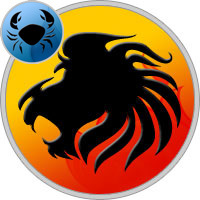 Good compatibility of Leo and Cancer in the work is possible only under the condition that Leo in this bunch will be the boss, and the Cancer will be subordinate. A fire sign always strives for leadership, even in an equivalent partnership, he will pull the blanket over himself, suppressing in every way a partner. Cancers can work in any of the positions, for them the main thing is that the work is creative and brings moral satisfaction. They also have different life rhythms: the water sign is slow and loves to do everything in deep reflections. Uncertainty forces you to double-check your work ten times, which also takes a lot of time and effort. Leos are rushing forward, and if they are mistaken, they will never admit it: anyone will be guilty, but not he. Therefore, an equal partnership will cause them a lot of friction and irritation. The compatibility of Leo with Cancer in friendship also does not have to be jealous. They can be polite neighbors, good friends, but they can never become bosom friends because of their different natures. Leo constantly draws to people — where he can get another portion of admiring views and make useful acquaintances, who in the future will help him to get some benefit. He loves noisy activities, active rest, filled with vivid emotions and impressions. Cancer, in the majority, are quiet and modest people who like to sit at home watching an interesting film or in case of emergency gather in a close circle of close people. It is only Destiny that can unite such different types of temperaments. Signs are radically different in their life priorities and values. But it is this fact that will contribute to the good compatibility of Leo and Cancer in love. They can attract to each other precisely those qualities that they themselves lack. Cancers are focused on trusting, long-term relationships, which in the after growth will degenerate into marriage. They patronize the partner, create a cozy atmosphere, which is very sympathetic to the proud Leo. He, in turn, attracts the water element with his ambitiousness, strength and strong-willed character. With such a partner, Cancer feels relaxed and protected. Admiration for each other and genuine interest in the beginning of the relationship determines Leo’s compatibility with Cancer in relations as beneficial. Next, they need to keep a balance, or what happens is what happened above: the fire will evaporate the moisture or the water will extinguish the flame. Leo loves freedom and will always strive to receive attention from the outside, so Cancer should loosen control and stop limiting it in action. In this case, the water element will cease to overheat because of feelings about possible treason and lose a drop for one’s strength. Then the partner will stay close, and will not plan a plan of escape from the boring and instructive Cancer. Compatibility of Leo with Cancer in bed can be almost ideal. They have different sexual temperaments, but successfully complement each other. Cancer, due to its subtle emotional organization deeply feels the partner, and creativity helps him to constantly invent something new, giving love to an enviable variety. What else does Cancer need? Bake and take care of the near. And what does Leo need? Be the center of attention and get care. An ideal combination, contributing to the fact that both partners are satisfied and satisfied. Leo for his part is ready to bring passion and energy to the bed. He takes on the role of ruler and gladly agrees to everything that the partner offers. And Cancer is not at all against giving the reins of government into the hands of a more active partner. Such a state of affairs in their union can ideally work for many years, they are unlikely to want to change what suits them both! But the compatibility of Leo and Cancer in marriage is not as rosy as in the intimate sphere. To have relationships based only on feelings is one thing. By legalizing them, the partners acquire mutual obligations, which sometimes require them to sacrifice and deprive them of their family and partner. And this is a completely different story. Can Leo abandon the usual bohemian life and become an exemplary family man? Reduce your bloated ego and start thinking more about your partner’s feelings? And is it possible, in turn, Cancer to give the spouse more freedom, and not to keep him with the death grip of his claw in his arms? In order to bring Leo with Cancer compatibility in a family life to a decent level, which will be comfortable for both, they will need time, and most importantly, a mutual desire to preserve their unusual union. If between them there are deep, real feelings, then it is possible that they will be able to become more flexible, learn to give in, make compromises, and think not only about themselves, but also in the interests of the family. In this case, their marriage will turn into a fortress, where Cancer is responsible for comfort, warmth and comfortable surroundings. And Leo is a brave defender and breadwinner.